The stigma plays a role, but a marketing campaign to change that could be more cost effective than the additional cost of light rail. Most BRTs operate exactly like Light Rail with limited crossings, signal control and their own rights of way. In fact many look very similar to Light Rail. The issue with BRT is it doesn’t have the capacity that Light Rail has, which results in similar operational costs, with BRT potentially more expensive. Brisbane Australia and Ottawa Canada probably have the most robust BRT systems (at least they did when I studied them back in 2003). I know Pittsburgh has BRT, Seattle has some and I think Los Angeles. 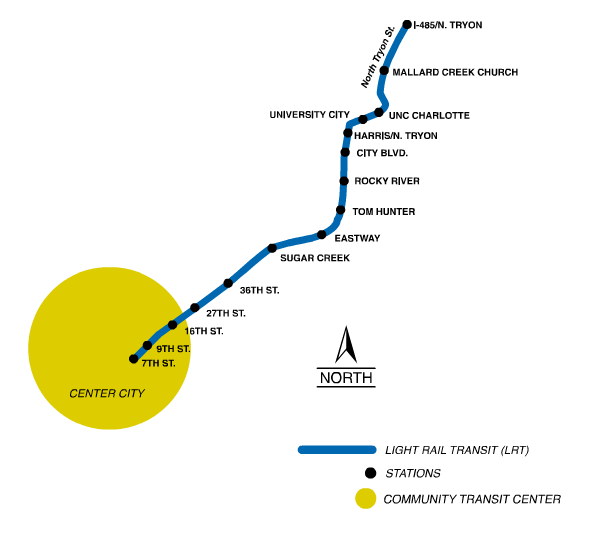 For comparison, The Blue Line extension in Charlotte cost $1.1 billion for 9.3 miles (approx $120M per mile). The El Paso BRT cost $27.1 million for 8.6 miles (approx $3 million per mile). Please correct me if I am wrong on the Charlotte numbers. clt says that is an intermodal facility, not a rail yard. McAppfan asks what do you think intermodal means? I think the link below is for the airport intermodal terminal? clt says a railyard is not an intermodal. McAppfan says if a train and railroad tracks are involved it is a railyard and if it also involves other forms of transportation (usually transfer trucks) then it is an intermodal railyard. At CLT three modes of transportation are involved-rail,truck,air. I was back down in U City (is that the correct manner to discuss the area of Charlotte around UNCC?) today and was listening to WFAE on the way back to Greensboro. They mentioned CATS would be talking about future transit ideas this Monday at 9 am. I thought those that have an interest in this topic might want to tune in. Is BRT a bus running on electrified overhead wires of a bus running on diesel but with a separate lane that is often physically separated by a barrier and not just separated by a strip of paint? If electrified, the cost is much higher but comes with some environmental benefits depending on the origin of the electricity. If diesel the benefits could allow for areas where a separate lane is just not possible to merge with regular traffic for a few blocks before diverging back into its own dedicated ROW. BRT does not interest me as much as light rail but it is something that is possible, is done in certain cities, and given the right size market can be a good option for mass transit. App fan is #2 poster now? Somebody has to keep this board going. Actually I have enjoyed getting to know some of the fans on the board. Learned quite a bit about the athletic program and university. McAppFan says it is the best promo video ever made. If they had built the blue line extension all the way to back creek church road as originally planned it seems like they could have built an Amtrak station there within walking distance of the blue line (isn’t the Amtrak line right there?). Seems like a lost opportunity that HOPEFULLY they will be able to rectify in the future by extending the line the additional two stops. I could see commuter trains from Kannapolis to downtown Charlotte getting some use. Build a stop in Concord and one in Harrisburg and you will get some riders I think. For the City as a whole I think light rail to the airport is the most impactful. It leverages and improves one of our biggest assists, the excellent CLT airport. I think that would be a huge success. You would have people all over the city taking light rail to their flights. They will need to have a true shared station (blue line and silver line junction) to make it effective. Is Back Creek north of the present end of line? Yes it’s at the intersection of 49/485/back creek church road. My understanding was that was supposed to be the last of two additional stations that had been originally planned. Google maps shows a rail line going right by it which I assume is the Amtrak line. I never heard about any plans of integrating the two but it would seem like a no brainer. They could have even ran trains as shuttles between stations in Kannapolis Concord and Harrisburg. Just run that back and forth a few times a day and you have a shuttle service to the light rail. I do remember reading that there was supposed to be a park and ride there as well and that some believe the lack of this park and ride at the 485 junction had hurt ridership. They need to finish that out in the next phase of growth along with rail to the airport. I can’t find the article or renderings, but I thought I remembered some old plans of the BLE going from campus to 485/PNC music pavilion area and then onward towards the speedway? Could be wrong…but as yall have mentioned, the line to the airport is crucial. Gateway station needed to be built uptown a decade ago. I like CATS CEO of the “Big Bang Theory” and build all the lines at once (Red, Silver, etc). Our interstates are too small…we need a legit rail infrastructure to alleviate some congestion. It will be costly, but at the rate, Charlotte is growing and the way transportation projects take so long here, the cost will only go up the longer we wait. Rumor I heard back in the day was that there was talk of going all the way out to concord mills or the speedway with the BLE originally. However, charlotte/meck and concord/cabarrus couldn’t agree on who would pay to build the bridges over 485 which would be the most expensive part. Cabarrus said it was in meck so meck should pay. Meck said that it would only be serving cabarrus so cabarrus should pay. No clue if this is how it actually went down but that’s what I’ve always heard. 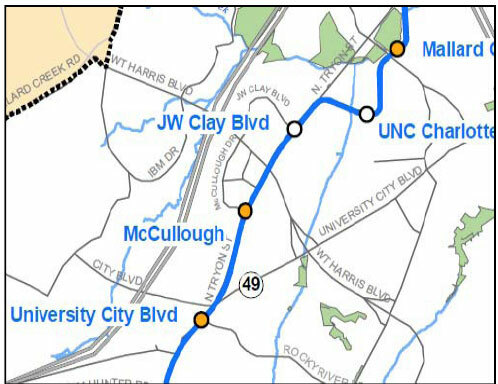 Light rail was supposed to go to I-485 and Tryon. P.S. Back Creek Church Road is getting realigned with Mallard Creek Church Road and the railroad will bridge over it. IIRC, what you have there was the “finalized” original version of the plan. We later scaled the finalized version back. Before the finalized version however, I do remember significant discussion about it coming into Cabarrus County, but don’t know the specifics about bridges or payment. I do know however that Harrisburg Town Council took a vote and said they did not want it coming into Harrisburg because they didn’t want all the crime and riff raff associated with it. I remember this specifically because one of my good college friends’ father was head of the Town Council at the time the vote occurred. I’m hearing the same type of opposition from some closed minded people in Belmont too. They are foolish if they think LR will hurt their town or property values. A shame towns with attitudes like that can’t be quarantined and not allowed to use the larger cities services, jobs, arts, entertainment. They would soon wither and die. After this happened a few times I think most communities near large urban areas would begin to appreciate a less insular view. That’s pretty much true for the entire rural state of NC vs. Charlotte, or vs. the larger cities. What is going on in the legislature right now is disgusting. Although, its always been pretty terrible.